Since 1995 Successful, Organic, Formic Acid Honey Bee Mite Treatment. But also prevents re-infestation in pollination and times of robbing. Extreme weather dependency, unreliability of treatment, and low efficacy. Queen and colony losses. Queen stopping laying. Brood mortality and drone sterility. Build up of resistance, contamination, and the danger of handling liquid Formic Acid. Reduces Nosema. Cleans chalk brood, and lesser wax moth. Repels Small Hive Beetle. UNUSED AND FILLED PADS IN KITS HAVE SHELF LIFE OF 10 YEARS. Include 22 - 5”pads. They have been used for nine years. 5.5 Lbs or 2.45 kg of 65% Formic Acid has been added into the kits. 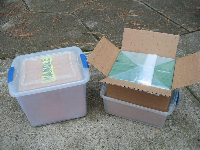 Then the bag and box are sealed immediately and the kit stands upside down for a few minutes. Before actual use, stand the kits upside down again for a few minutes. Each kit will treat 4 two high colonies twice a year with 3 five inch pads: in August, leave them in until April, throw them out and put 2 new ones in. Remove by June. TO PROTECT WINTER BEES: Mitegone Is designed to work in heat of August when winter bees are reared. All treatments in late September or October are too late! The damage to brood of winter bees is already done and the colony may collapse. Include 162 -5”pads, and will treat 54 hives with 3 pads, and 81 with 2 pads. Using a scale gently pour 40lbs / 18.18kg of 65% acid into centre of KIT. Close bag and box and stand it in latched box upside down for 5 minutes, repeat this before actual use. FILL and transport each kit to your bee yards in its own sturdy plastic latch box available at: (WALMART Sterilite No 1925 27 Qt./26 L. 16 1/2”x 13” x 12 1/4”) full height of dry kit with latching lid, and strong handles to carry KITS for. dispensing into hives. Colony: of 2-4 frames in 4-5 frame nuke box = 1 pad. Mating nuke Reduced pad. Splits 5-8 frames in one brood box = 2 pads, Pollination unit (shown) 8-10 frames in one brood box and Second box of Empty frames for expansion or honey collection = 2 pads. Two Boxes of honey and bees ready to winter in late August =3 pads. Boomers in June ready to swarm; Split them and treat as pollination unit. Before opening new kit Stand it upside down for 5 minutes. Open kit and plastic bag. Use rubber gloves. Pull the bag partly out for easy removal of pads. DO NOT UNWRAP THE PADS! In late August. 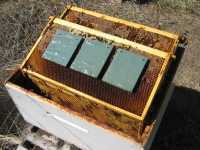 Pin 3 soaked 5”pads to the outside of the outermost honey comb of any TOP box, open end down, and put it in the hive. Leave the pads in the hive until April. Refill or put 2 new pads into the hive in early April. Throw out the pads in late May. How well it works, read CREDIBLE USE LEGAL STATEMENTS by qualified people. Availability: The MiteGone® Treatment for Varroa and Tracheal mites is astonishingly simple! You buy the Formic Acid locally. 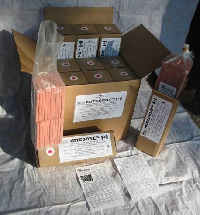 Buy the DRY KITS directly from MiteGone® or DRY or FILLED from OUR AGENTS. Pads are one item that is inexpensive, simple, and easy to use in many ways. Available as dry or pre-soaked pads in kits. Treatment is not weather dependant, but adjustable to local conditions. The product works as long as the bees do not cluster. The bees maintain steady internal temperature and humidity, thus maintaining the evaporation rate in the bee hive. MiteGone® uses the continuous low dose release method which works on the principle of evaporating a miniscule but steady flow of Formic Acid fumes through the hive which is finally contained at the bottom board. This forces bees to ventilate through this pool of Formic Acid and deliver a low concentration of the Formic Acid's fumes to the brood chamber, knocking the mites off and killing them in the pool of heavily concentrated Formic Acid fumes on the bottom board. In addition it makes mites sick and infertile so they keep dying. Treating varroa mites with formic acid does not cause overdose symptoms and is not weather dependent. MiteGone® pads fit into the existing bee space between the frame and wall in the hive without any additional box, rim, or equipment. Heat and humidity is maintained by bees only between frames. Pads contain enough Formic Acid: for 21 or more days of treatment to treat low and medium infestation, and by adding or replacing pads to treat high infestation levels. Method eliminates measuring Formic Acid into a dispenser. The product soaks and holds the exact amount of Formic Acid automatically. Pads contain Formic Acid without dripping and evaporates Formic Acid at a constant rate on the principles of capillary tube and gravity. MiteGone® is a one-visit treatment that does not require any specific time for removal or disposal? Remove it or REUSE pads when pads are dry the next time you work the hive. Pads are disposable for the commercial operator but allows for re-use by the penny-pincher without transferring diseases. Re-soaking in Formic Acid sterilizes the pads. © Copyright 2018, MiteGone® Enterprises Int., All Rights Reserved.